In 1969 historian Sheldon Hackney submitted a paper to the American Historical Review titled Southern Violence. He pulled his data from as far back as the 20s and into the 50s. So at best, his info is now over half a century old. But current studies bring back the same result: the South is much more violent than the rest of the country. Many potential hypotheses have been presented to account for this, but one of the most prevalent is the notion of a Culture of Honour being present in the South. A notion which that while it is necessary to be polite and respectful to others, it is equally necessary to respond to an insult upon one’s character. And to respond immediately and with conviction. This ain’t a place where “turn the other cheek” really flies. Not even “an eye for an eye” works down there. And, again, the science has borne this out, showing southerners more likely to respond violently to perceived insults such as being bumped by a passer-by on the street. Whatever the reason, it’s only one aspect of the South. Let’s not throw the baby out with the bathwater here. Think of all the wonderful things we associate with the South: BBQ, high school football, Southern belles, fried chicken, the blues, sweet tea, pecan pie, moonshine, Bo Diddley, Elvis, it’s all good stuff. The south also has a rich literary history with arguably some of America’s greatest talent coming out of the region: William Styron, Flannery O’Connor, Cormac McCarthy, Harper Lee, William Faulkner, Tennessee Williams. These authors have created some of the most indelible works of Americana ever produced. While the South may be the country’s most violent region, it also might be it’s most creative. It definitely takes the cake as far as music and writing goes, and now comic books might be joining the list. The newest entry into the pantheon of the South? 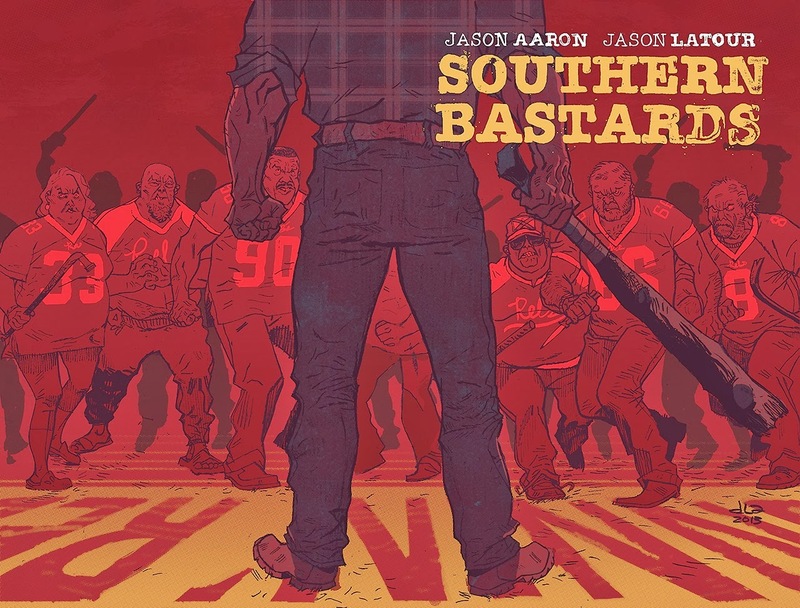 Two southerners, writer Jason Aaron and illustrator Jason Latour have been producing, over the last several months, a work which deals explicitly with those aspects of the South we find so repulsive. And they do it from an insider’s perspective. The first story arc, and first four issues, were released this week by Image Comics in trade paperback form. This might be the ideal way to take in the story. Issue 1 came out in April, and it does a wonderful job of hooking the reader in right away. I’ll be honest though, by issue 3, I was dying for more depth. I wanted to know what was behind these characters, where they were coming from and their motivations for all the dramatic actions. Issue 4 alleviated that tension much the way a resolving chord does in a good song. The month (sometimes more) long wait between issues was worth it, but had I been given the opportunity to read this as a whole, I would’ve taken it. 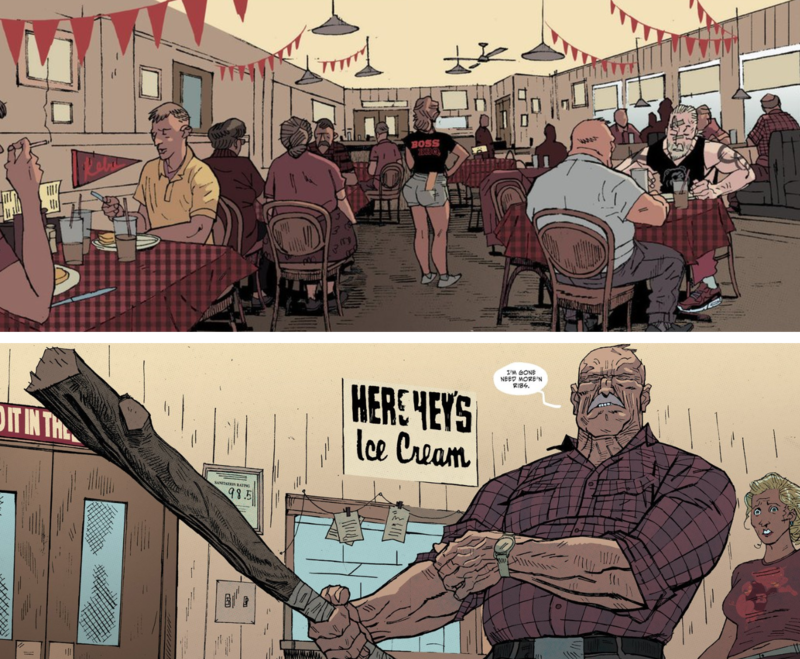 Aaron and Latour’s Southern Bastards is really more a work in atmosphere than anything else, and that’s why it excels. The storyline is marvellous and always has me excited for the next issue, but it’s really the art that has the initial power over you. Latour’s work creates a thick, intense, muggy tension like a perpetual late August heat wave. Once immersed, it’s easy to let Aaron’s story of organized crime, parental issues, and corruption take you away. Earl Tubb, a man in his 60s or so, returns home to Craw County Alabama to deal with the estate of his estranged father, and comes into some trouble along the way. I’ll leave it at that. Southern Bastards is firmly rooted in the stereotypes of the south. It exaggerates the negatives and only occasionally hints at the positives, usually shunning them altogether instead. This doesn’t mean it’s a one-dimensional portrait of the South, it means it’s a focused piece of art. And it’s done so well that suspension of disbelief comes easily. Aaron’s character Earl Tubb and Craw County Alabama are as real in my mind as Macon, Georgia. Earl Tubb, laying it down. In Tubb, Aaron has created a unique hero, and I think he may eventually seep into popular culture in some way because he’s that interesting. You’re getting older. How does that make you feel? Grey hair, wrinkled skin, cancer, Alzheimer’s, and all that. It’s probably not something you’re looking forward to. Earl Tubb may very well be the fantasy of a man afraid of getting older. He’s gray and wrinkled to be sure, but he’s also sharp as a knife, strong as an ox and commands respect. Not realistic, sure, but definitely something to aspire to as you get on. And as great as Tubb is, his adversary Coach Boss is the one who I really want to see more off. They leave him and his whole organization just simmering on the back burner. It’s always there; it’s the focal point of the story in many ways, but Aaron just lets the tension build. I always liked comics when I was a kid, but I was never as obsessed with them as some of my friends. I’ve come to appreciate them more as I’ve grown, but also come to dislike the move away from the superhero genre. I know “comics aren’t just for kids anymore” and all that, but part of the fun of comics was how fantastical they were. All the comics with adult story lines and stuff like that never interested me. Give me Batman, Spider-Man and the X-Men any day of the week. But Southern Bastards has started to change that. I would never let an 8 year old read it, but it’s pretty damn good so far.